A call from a journalist or producer can strike terror into the hearts of even the most relaxed of us. Download your FREE CHEAT SHEET for our expert tips: they’ll help you get through your next media interview with ease. 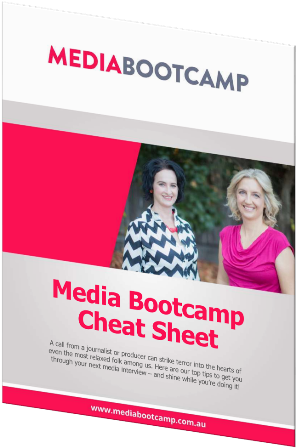 A one-day, tailored crash course in how to survive and thrive in Australia’s rapidly changing media landscape. A short, sharp training session (half day) putting you in the media hotseat for your next media opportunity.